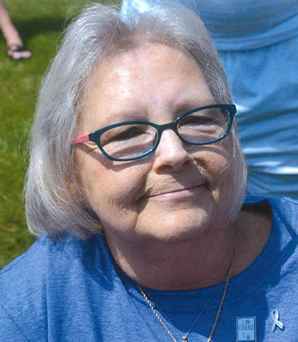 Ellen C. Seibel, 63, of Fremont, OH passed away at home surrounded by her family on Sunday, February 4, 2018. She was born in Monroe, MI on September 20, 1954, to Andrew Ball and Patricia (Malohn) Chellis. She was a graduate of Roy C. Start High School in Toledo, OH. Ellen married Charles Seibel on December 24, 1995 in Clyde, OH and he preceded her in death on February 7, 2010. Ellen was a homemaker and a member of the American Cancer Society-Relay for Life – Team Angels Among Us. She enjoyed spending time with her family, fighting for Relay for Life, and watching her grandson play football. Ellen is survived by her children, Lisa (Sean Henderson) Krum and Kimberly (Ken) DeVault both of Fremont, OH; siblings, Sue Dornquast, Fremont, OH, Pat Toller and Michael (Susie) Ball both of Clyde, OH, Wanda Downing, Green Springs, OH and Nancy Omey, Toledo, OH; sister-in-law, Vi Chase, Helena, OH; grandsons, Devin Lee and Gunner DeVault; world’s best caregiver, Beth Biller-Jennings; many loved nieces, nephews, great nieces and nephews and friends who are considered family. She was preceded in death by her parents; husband, Charles Seibel; adoptive mom, Louise Davis; brother John Chase; brothers-in-law, Tom Toller and James Omey; many aunts and uncles. Visitation: Friday, February 9, 2018 from 2 pm to 4 pm at Wonderly Horvath Hanes Funeral Home and Crematory, Fremont, OH. Services will begin at 4 pm at the funeral home with Pastor Glenn Merrill officiating. Suite B, Perrysburg, OH 43551. My heart hurts for her presence but rejoices knowing she is in Paradise with our maker. Much love to you all. Praying for comfort. so sorry for you your loss she was such a sweet lady always acting tough but nobody believed her lol, loved being her friend and hairdresser for many years,love ya all and know that you will miss her terrible,but I can hear that laugh and she is in good hands. Ken Kimberly and Gunner we are praying for you all in this time and hope you will have plenty of good memories to hold deep in your hearts forever. God Bless your family. Auntie Em you truly were special and an angel. You had the kindest heart. You found good in everyone and everything. You fought to your last breathe. You were loved by all who knew you. You will be missed by all. So happy you are cancer free, pain free, and whole again dancing with Jesus. Until I get up there, party like the rockstar you were. Love you to the moon and back! May you find peace in the Lord at this difficult time.